A roomy backpack for everyday use. Patened, fully rotating, 360° Response swivel handle automatically swings an locks into a natural holding position in response to any change in direction for flawless handling. Spacious main compartment with garment tie-down straps and large mesh pocket. Convenient front daypack with organization pocket detaches for casual use; other docking bag styles are available for purchase. Large 80mm in-line skating wheels contain cartidge bearings ensure a smooth and stable roll. Mono-pole spine system is curved top for stability and comfort. Anatomically-shaped back panel hugs the wearer's back and flexes with movement. Zip-away support belt snaps in the middle for added support. On the Outside, this piece is extraordinarily designed. Extremely functional pockets and compartments come standard in the backpack collection. Illustrated in black/black. Also comes in red/black or cobalt/black. In the Inside, this piece has a generous amount of pockets for all you travel needs. 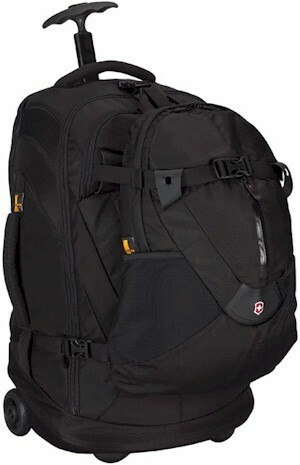 All Victorinox Backpack pricing includes Free domestic shipping and more. Also, no sales tax if shipped to anywhere outside the state of Michigan. On line ordering is of the highest level secure format. We have been in business for over 50 years and offer 30 day Money Back Guarantee. All Victorinox pieces are backed by Manufacturer's Warranty. We also can gold hot stamp your initials at no extra charge, just specify desired initials under "Special Instructions" when placing order.